People have asked me what will happen to the judging program and the Masterpiece Quilt program. Their certified judges have formed National Association of Certified Quilt Judges, which will continue with professional quilt judging, and they will also be managing the Masterpiece Quilt program. As we approach 2016 and the final dissolution of The National Quilting Association, Inc., I want to share with you the steps taken by the Board. 1. The Grant Committee reviewed grant applications and selected 16 grant recipients who received a total of $31,390. Those funds were restricted by donors for the Grant Program. Projects covered a range of community service, educational efforts and preservation activities. 2. The National Association of Certified Quilt Judges has been formed to carry on the tradition of excellence in professional quilt judging. They will also be managing the Masterpiece Quilt program. Their new website is up and can be found at www.nacqj.com. Many thanks to the NQA Certified Judges whose efforts established a new organization that will continue to offer this valuable service to quilters and quilt guilds. 3. The Quilt Alliance has agreed to take on support of National Quilting Day. There will soon be details on their website (http://www.allianceforamericanquilts.org) celebrating this global day that recognizes the special art form that is quilting. Make note: March 19, 2016! 4. Historical records of NQA are being donated to the University of Nebraska – Lincoln Libraries. These materials will be housed in the Quilt Collections of the Archives and Special Collections Department. Once archived, they will be available to those interested in reviewing the materials for research and teaching purposes. 5. We have taken the steps necessary to file for dissolution of the organization with the State of Maryland as that is where NQA was originally incorporated. Several of you have asked about obtaining a refund of dues paid prior to the decision to dissolve the organization. We regret that we can not make any refunds as the orderly close of NQA necessitated meeting outstanding financial obligations. Many thanks to all of those who, through the years, worked so hard to share the art of quilting with so many through NQA’s programs. A special thanks to the current Board, all of whom did their very best to sustain NQA, something we unfortunately were unable to accomplish. Despite that, we know that the future of quilting is in good hands – yours. Here is a very good visual and explanation of how to make a beginner eight-pointed star by Edyta Sitar, which shows how easily the set-in seams can be sewn into the corners of the star. The exhibit Nineteen Stars: Quilts of Indiana’s Present & Past is at Old Gallery of University of Evansville in Evansville, Indiana. It will be showing through January 10, 2016.
http://evansvillemuseum.org/exhibitions/current/ is where you can get more information about the exhibit. NINETEEN STARS: QUILTS OF INDIANA’S PRESENT AND PAST, begins the Evansville Museum’s celebration of Indiana’s upcoming Bicentennial. The theme is drawn from the 19 stars depicted in the state flag that commemorate Indiana’s position as the 19th state to join the Union. Stars were favored quilt patterns in the 19th and 20th centuries and appeared in many variations. The 19 historic quilts in the exhibition span 150 years of Indiana quiltmaking from the 1830s to the 1980s and were selected from the collection of the Indiana State Museum. 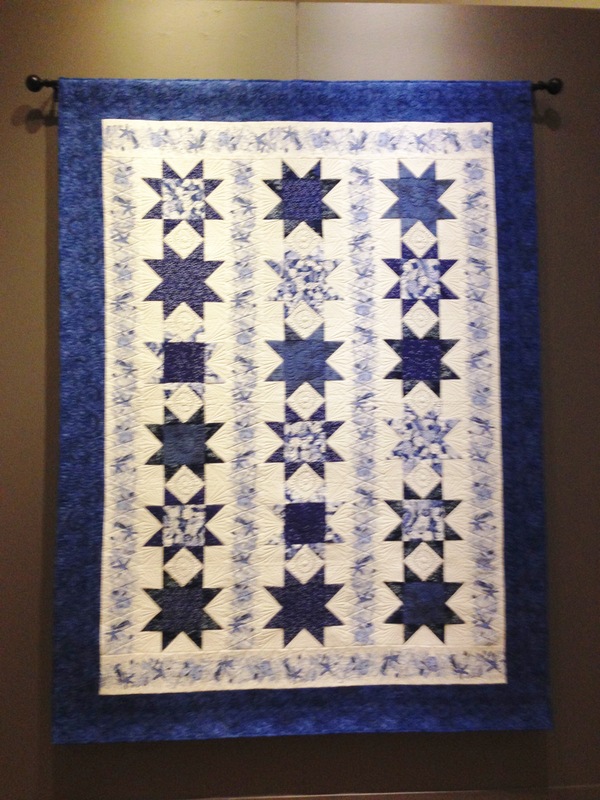 The 19 contemporary works, which were created specifically for this exhibition by some of Indiana’s outstanding quilt artists, incorporate the star theme in a number of ways, from overt to illusory. 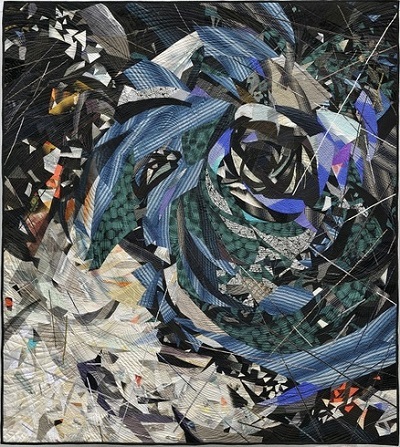 The artists’ techniques vary widely, from traditional piecework and appliqué to improvisational collage, layering, digital media or richly textural thread painting. The New England Quilt Museum will host the US premier of the 12th Quilt Nihon Exhibition. NEQM is the only venue in the Northeast to showcase thirty-two of these award-winning quilts from one of the world’s most prestigious competitions, sponsored by the Japanese Handicraft Instructors’ Association.